Check out CardPlayer.com every Friday for a weekly wrap-up of the news from the live poker tournament trail. Three of largest poker tours on the tournament circuit awarded more than 1,000 points to champions at recent tour stops in the last two weeks. 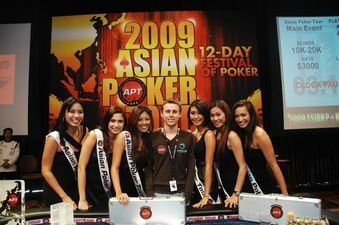 The Asian Poker Tour main event in Macau was won by Frenchman Adrien Allain, who took home $391,603 and 1,188 points. Allain recorded the first major tournament cash of his career with the win, but he remains ineffectual in the POY race with a current standing in 191st place. The PokerStars European Poker Tour main event in Kiev was won by Maxim Lykov, who captured $473,088 and 1,440 points. Lykov stands in the best position to make a run at the POY top 10 among the three recently crowned champions, he now holds 2,336 points total and sits in 31st place. Lykov picked up the other chunk of his points when he finished in third place in event No. 41 ($5,000 no-limit hold’em shootout) at the World Series of Poker. Lykov picked up $145,063 and 896 points for the June cash. The World Poker Tour Legends of Poker championship event was won by Prahlad Friedman, who was awarded $1,009,000 and 1,690 points. It was the second tournament cash of the year for Friedman, who finished in 64th place at the WSOP main event. Friedman jumped to 80th place in the standings after scoring his first WPT victory. He now holds both a WSOP bracelet and a WPT title. The Legends of Poker was also a boon to many other players in the POY race, helping them climb in the standings. November Nine member Kevin Schaffel was awarded 1,400 points for his second-place finish, and he could emerge as a major contender if he wins or finishes in the top three at the WSOP main event final table in early November. Todd Terry finished in third place at the Bike and took home 1,120 points. That built Terry’s point total up to 2,716 for the year, leaving him just outside the top 10. He is currently in 13th place. Terry’s first big cash of the year came all the way back in January, when he finished runner-up at the Borgata Winter Open championship event and picked up a strong base of 1,500 points. Peter Rho scored a small amount of points for his 24th-place cash (42 points) in L.A., but it was enough for him to secure 16th place with 2,642 points on the year. The lion’s share of Rho’s points came from runner-up finishes at the Aussie Millions main event (1,600 points) and event No. 11 ($2,000 no-limit hold’em at the WSOP (1,000 points). When the final table at the 2009 World Poker Tour Legends of Poker $10,000 no-limit hold’em championship began, Kevin Schaffel held the chip lead. Schaffel was appearing in his first live tournament after making the November Nine in the World Series of Poker main event, and he was riding a world of momentum as he stacked chips throughout the week in L.A. While Schaffel is still looking for his first WSOP gold bracelet, Prahlad Friedman was one of two players at the Legends final table who already held one (Toto Leonidas being the other). By the end of the night, Friedman had captured his first WPT title before Schaffel, as well, beating out the November Niner in the heads-up final to win the first-place prize of $1,009,000. Friedman proved once again that poker is fun for everyone — except for his opponents. Mike Krescanko fell quickly in sixth place to begin the action shortly after play began this afternoon, and then there was a long lull in the action. This was partially due to slow play at the table, but also due to a series of technical difficulties. It took a couple of hours before Sam Stein fell in fifth place and the final four was set. Leonidas was the next to fall after hanging on for a long time with a short stack. He doubled up multiple times, but he eventually fell in fourth place. Todd Terry looked like he might be the favorite to win the tournament during the final two days of play as he flirted with the chip lead, but his fortunes changed during the final stretch of play as he busted in third place. The heads-up final began with Friedman holding a healthy portion of the remaining chips in play (6,605,000). Schaffel entered heads-up play with just 1,850,000, but he was able to to double up quickly to bring the chip counts close to even. Just 14 hands later, though, the final table came to a close, and Friedman was the champion. Maxim Lykov came into the final day of the €5,000 no-limit hold’em main event at the PokerStars European Poker Tour stop in Kiev, Ukraine, with the chip lead. He held onto that lead and defeated a field of 296 players to win his first major tournament title on Sunday, Aug. 23. The young player also became the first Russian to win an EPT event. The final table began slowly in the cavernous surroundings of the Kiev Sports Palace; it took an hour and a half for Vadim Markushevski to bust out of the tournament in eighth place (€30,000). A half hour later, Torsten Tent was eliminated in seventh place (€45,000) by Lykov, and then the eventual champion scored his second knockout at the final table when his pocket tens busted Adrian Schaap in sixth place (€60,000). Another wall slowed down the action five-handed, and it took three hours for the next player to fall. Vitaly Tolokonnikov (pocket queens) and Lucasz Plitcha (pocket eights) got it all in preflop, and both a queen and an 8 came on the flop to give Tolokonnikov a set-over-set victory in the hand. Plitcha was eliminated in fifth place, and he took home €80,000 in prize money. Fourth place was decided just a few minutes later, and for the second time that day, pocket tens sent a player to the rail. Alex Dovzhenko held the tens, and they were more than enough against the Q-8 of Arthur Simonyan, who was eliminated in fourth place (€100,000). The final three players then went to dinner break with the chip stacks pretty close to even at 3 million a piece. On the first hand back from the dinner break, Lykov scored his third knockout for the day in the biggest hand of the tournament. Tolokonnikov raised to 220,000 preflop, and Lykov reraised to 550,000. Tolokonnikov then moved all in, and Lykov made the call. Tolokonnikov flipped over pocket sevens, and Lykov held A-J. The board ran out Q-5-3-A-8, and Tolokonnikov was eliminated in third place (€140,000). Lykov won the hand to take his chip stack up to 5,895,000 at the beginning of heads-up play. Dovzhenko held 3,020,000 at the start of heads-up play, but in less than an hour, his stack had vanished. On the final hand, Lykov raised to 220,000 preflop, and Dovzhenko made the call. The flop came J-7-4 with two spades, and both players checked. The turn paired the board with a 4, and Lykov checked. Dovzhenko bet 400,000, and Lykov check-raised to 1 million. Dovzhenko moved all in, and Lykov called. Lykov revealed 9-4, and Dovzhenko turned over J-10. The river brought an ace and ended the tournament. Dovzhenko was eliminated on the hand in second place, and he took home €220,000. Lykov emerged as the champion, and he was awarded €330,000 for the victory. Adrien Allain found a very unconventional way to win over $3 million HKD on Aug. 23 at the Asian Poker Tour Macau main event. “I’m overwhelmed; this is so wonderful. I qualified for this tournament through a $5 lottery tournament on PKR and end up beating all these top players. Vive La France,” said Allain after the victory in a press release from the APT. The $32,000 HKD ($4,400 USD) no-limit hold’em main event in Macau began on Aug. 20 and attracted a total of 326 players, and by Sunday, Allain had beaten each of his opponents to take home the top prize of $3,035,000 HKD ($391,556 USD). Allain came into the final table facing some tough competition in Casey Kastle, David Steicke, and Poker Pack team member J.C. Tran, but Allain held on to win his first major tournament title in Macau. Kastle was the first to fall at the final table in ninth place ($16,966 HKD). Ironically, he was defeated on the third hand of play at his third consecutive APT final table. Allain busted Kastle when he hit a straight on the river. Winfred Yu was eliminated in eighth place ($26,112 HKD), and then Allain scored his second elimination of the day when he made another straight to take out Christer Hallbrook in seventh place ($39,167 HKD). Michael Woo fell next in sixth place ($52,223 HKD) when he ran into the pocket kings of Allain. Just 20 minutes into play, four players had hit the rail. Things then calmed down for a little bit before Chris Chau was eliminated in fifth place ($65,279 HKD). That set the stage for a four-handed battle, during which Tran and Steicke became active to seize the opportunity. The elimination of Steicke in fourth place ($91,378 HKD) slowed the action back down, and it took more than an hour for the next player to fall. Tran was forced to move all in preflop for his final 166,000 when both Allain and Inwook Choi called him down. Tran made aces up on the hand, but for the third time at the final table, Allain made a straight to eliminate an opponent. Tran was eliminated in third place ($117,470 HKD), and action was down to heads up. Allain took a 2-1 chip advantage into the heads-up match, and it took him a half hour to eliminate his final opponent and finish an impressive victory. On the final hand, Choi found all of his chips in the middle preflop with A-Q. Allain made the call with A-3, and the board ran out 7-2-3-J-J. Choi was eliminated in the hand in second place, and he took home $1,660,000 HKD. Allain was crowned the champion and he was awarded the top prize of $3,035,000 HKD.